Today we checked another item off our Kids Summer Bucket List I made for Ava and I this year and we headed to the farm for some strawberry picking! I swear, every time we go to the farm Ava enjoys herself more and more and this time was no different. She fell in love with the bunny at the petting zoo, gave the goats lots of big hugs (see my Instagram stories for the video), rode a pony (or "little ho" as she calls the horses), and she ate more strawberries than she put in the basket. Today was a success and my heart is so full. I think I need to be more grateful for these moments I get to enjoy with Ava, thanks to my career as a mommy blogger. It's not easy working and being a stay at home mom blogger but I sure am thankful for all of this time I get to spend with my little girl. Kids ripped jeans, baby distressed denim...whatever you want to them -- I just call them adorable. Ever since Ava was about 6 months old she's been wearing baby ripped jeans and every single time she does, my eyes turn into hearts. I mean, do you blame me? 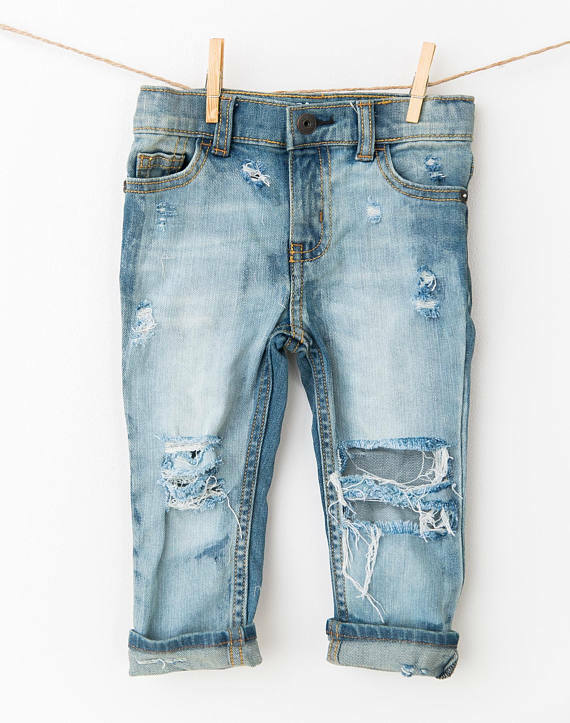 Kids ripped distressed denim is the absolute cutest and a lot of you have been asking where we buy Ava's. Well, we buy it all over the place so I put together a little round up of super cute distressed jeans for ya -- cute kids clothes for the win! just click on the photo and it will take you right to where you can shop them! All links included above are affiliate links, meaning I make a commission when you purchase via these links. You pay the same exact price and the shop makes the same amount too so it's a win-win for everyone.